Akhilesh Yadav, who scripted spectacular success in the Uttar Pradesh assembly elections with an image makeover for Samajwadi Party, will be the new and youngest Chief Minister of the state, representing a generational shift in its politics. The 38-year-old leader will be sworn in as chief minister around 1 PM on 15th March along with other members of the cabinet. 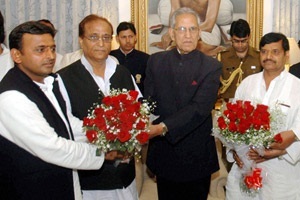 Ending all speculation, Akhilesh, son of SP supremo Mulayam Singh Yadav, was elected leader of the SP legislature party unanimously after senior leader Azam Khan, who is said to have had some reservations, proposed his name. It was seconded by Mulayam's brother Shivpal Singh Yadav, who also reportedly had some misgivings initially about handing over chiefministership to the young leader who is credited in a major way with reviving the party's fortunes in the elections. His predecessor Mayawati was 39 when she first became chief minister in 1995 in a coalition government with support from SP. Shortly after the election at the legislature party meeting which included MPs, Akhilesh Yadav told reporters that his government would implement all the promises made in the SP manifesto without discrimination of caste and religion because people cutting across all castes and religions have given a mandate to the party. Tackling law and order will be his government's priority, he said, adding honest officers would be appointed to deal with the issue.